January is thyroid disease awareness month and several nail artists (including myself) have collaborated in order to spread awareness. I didn't know much about thyroid disease before particpating in this collaboration, so when citruseyes contacted me about participating and learning a bit more I jumped at the chance. The collaboration is still open, and if you're interested in particpating you can check out he hashtag #TDAMani on instagram. Symbols for thyroid disease awareness are: blue, paisley design, and the butterfly. You can also check out #TDAMani to see the beautiful works above up close. Check below the cut for a closer look at the design I put together (can you guess which one it is in the graphic above?) and for a lot more useful info about thyroid disease. Did you guess which one was mine? :) When I saw that one of the symbols was the butterfly I knew it was the perfect time to try out my new butterfly shaped puncher. 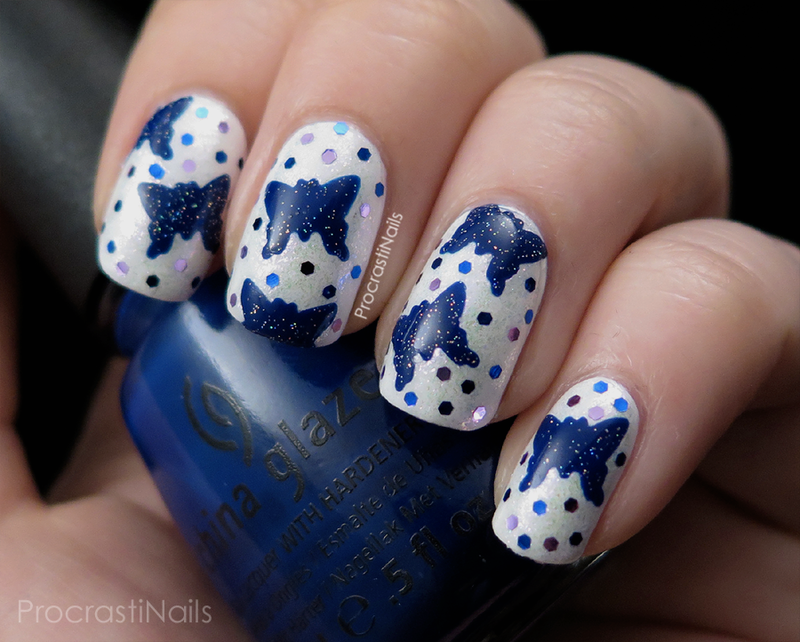 I started with a base of Essie Blanc and then added some shifting pink shimmer with China Glaze Travel in Color, and then I made my butterfly decals with China Glaze Man Hunt and China Glaze Fairy Dust. I sealed my butterflies in with some Seche Vite and then placed some individual pink and blue hex glitters to pull the whole look together. See, no raised edges around my decals! It merged seamlessly with my base. And no colour bleeding! This is also the best picture to see the shimmer from Travel In Color - the pink shimmer didn't translate too well with my lighting so it's really subtle. Overall I'm super happy with how this turned out, and I'm proud to include it in the collaboration with the rest of the lovely looks. Hopefully by sharing these designs we can raise some awareness of thyroid diseases. The thyroid is the butterfly shaped gland located in the neck that is responsible for releasing hormones that regulate growth and metabolism. Some examples of thyroid diseases include: Hashimoto's thyroiditis, Graves' disease, thyroid cancer, and postpartum thyroiditis (but there are more); thyroid conditions related to these disease are hypothyroidism or hyperthyroidism. There are no cures for most thyroid diseases but there are various treatments available such as surgery, medication, hormone replacement, and lifestyle modifications. Often times, patients may not “look” physically sick but are still in pain and suffer regularly. Hypothyroidism is a condition when thyroid hormone levels are low and can be caused by the autoimmune disease Hashimoto’s thyroiditis, radiation therapy, or thyroid removal due to cancer or hyperthyroidism. Symptoms may include: fatigue, lethargy, puffy face, constipation, weight gain despite poor appetite, cold insensitivity, dry skin, slower heartbeat, and more. It can lead to a fatal condition known as myxedema coma if hypothyroidism is not treated and becomes long standing. Babies born with congenital hypothyroidism risk mental retardation and growth delays. Hyperthyroidism is the opposite: it is when thyroid hormone levels are high. It is oftentimes caused by the autoimmune disorder Graves' disease but can also result from toxic multinodular goiter or thyroid adenoma. Symptoms may include: anxiety, increased irritability, diarrhea, weight loss despite increased appetite, heat insensitivity, hand tremors, insomnia, rapid heartbeat, and more. It can lead to a fatal condition known as thyroid storm if hyperthyroidism is not treated properly. Thyroid storm can lead to heart failure, irregular heartbeats, and death. Thyroid cancer, like other forms of cancer, needs to be detected early in order for early treatments to increase the chances of survival and decrease the chances of complications. Symptoms may include: a swollen throat, pain, difficulties swallowing, hoarse voice, and feeling a lump present on the throat. Some thyroid issues can also occur post pregnancy. Postpartum thyroiditis is when the thyroid becomes inflamed after childbirth. Symptoms can either be hypothyroid-related or hyperthyroid-related symptoms. In mild cases, treatment may not be necessary, but in some cases, patients can develop chronic hypothyroidism. 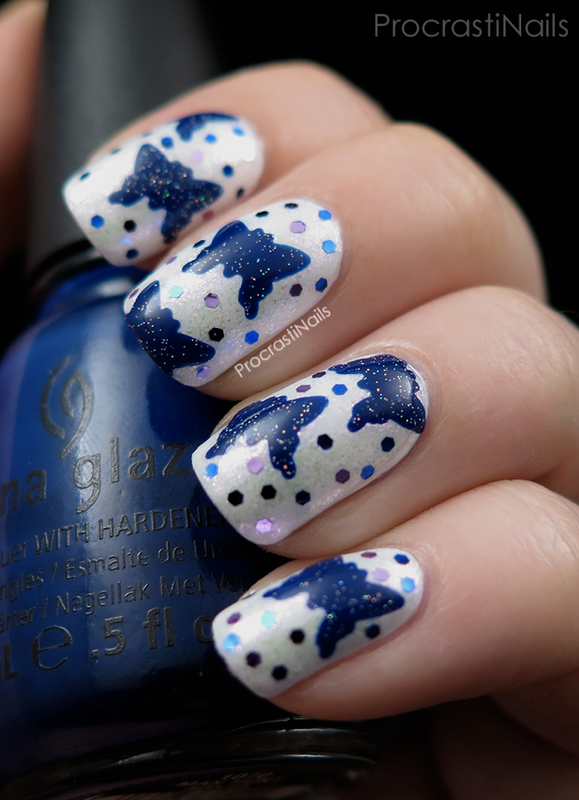 This is a lovely manicure to help being awareness to this! I love the little butterflies! I love your mani! Great DIY decals too!! Very pretty! And great that you all bring awareness to this. Both my aunt and my mother deal with thyroid issues and I'm constantly checked at the doctor because of this. Definently not an easy thing to deal with. Aw I love those butterflies! Really great mani for a great cause. These are perfect! Wish I had a butterfly punch. The placed glitters was the perfect way to finish it off too! 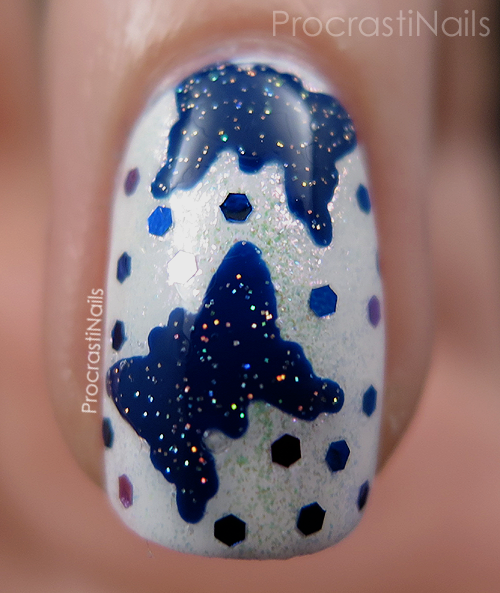 Those glitters go perfectly with the butterfly decals you made. This is SO pretty! Love the decals! What a beautiful look! And definitely interesting to learn something about the human body, as well. 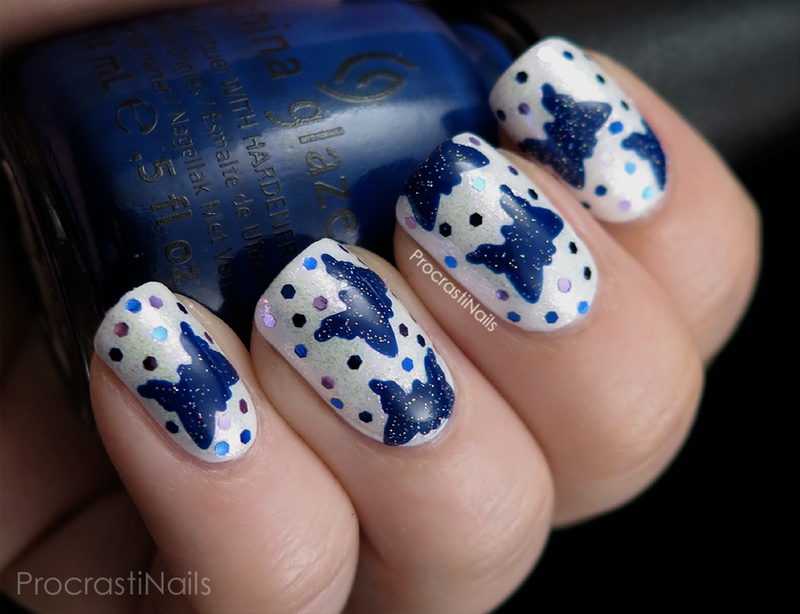 A beautiful mani for a worthy cause. I have thyroid disease and had no idea that January was thyroid disease awareness month. I will definitely need to do a mani before the month is over. It's something that doesn't get talked about enough.